Paladin: None is so blind as he who will not see. The puma attack occurs AFTER Paladin has received the $2500 reward in Santa Fe. He is heading back to San Francisco. The key to the story is the complicity of the entire population of the small town, Prarie (sic) Orchard. Everyone lies in order to share in the culpability. The money was distributed in payment for debts among the towns people, as is shown in the final scene. In retrospect it is amazing how elaborate the people went to create the deception. The opening is a dilemma in itself. Paladin is playing a chess game against himself based upon the strategies of Napoleon and Hannibal. As he states, after making a move, he has to block out the strategy of the previous player and assume that of the other. 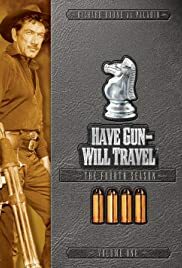 His deductive skills are put to test from the observations after the attack while he is in a semi-conscious state, of the two men who found him, but leave him to die - a ring, spurs, boots, a gun holster, and voice accents.